I love granola much more than I should. Yes, it is healthy, but not eaten by the handful like it so commonly is (in this household anyways). After the gluten episode this past weekend we were forced to re-evaluate our oat consumption. I was going on a nice streak there for a while where I had oats every breakfast – and I mean each and every breakfast. Sure, there were a couple of other things thrown in their occasionally, but usually it was oats. Regular oats, steel-cut oats, oat bran, overnight oats, dough-boy smoothies… Because of the sheer consumption of oats and a new employee budget, gluten-free oats was not something that I even wanted to think about. Yes, I will pay $2 for more oats and avoid paying $6 for just making sure they’re not cross-contaminated with wheat. Well, as I now know – gluten-free oats should be the star of the show here. Unfortunately we had over half of a big tub of good ol’ quaker oats to use up and I was not going to throw away any more food. And there’s no better place to use up food you can no longer can eat than on your friends! I surprised one of my good friends with a big ol’ bag of this granola. And I will definitely be making it again for myself and sister with gluten-free oats. 1. Preheat oven to 300′ and get out a rimmed baking sheet. 2. 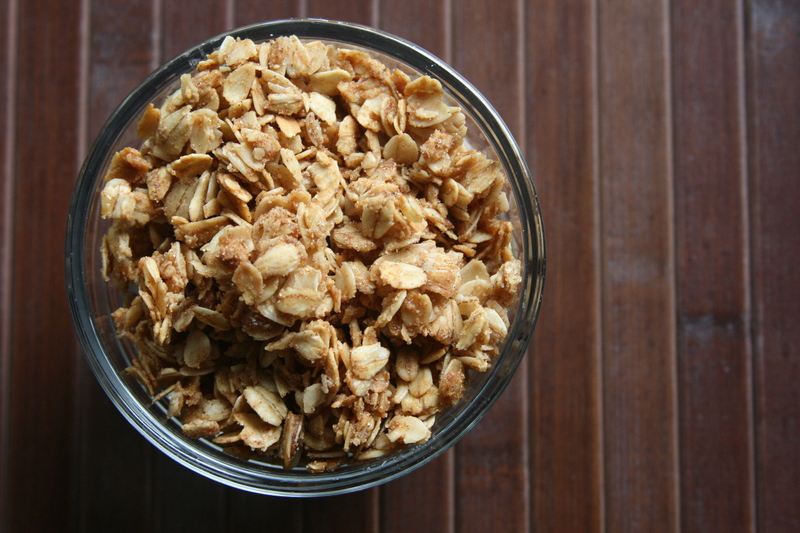 Place rolled oats into a large bowl and add in the brown sugar, flour, salt and cinnamon. Mix to distribute. 3. In a small sauce pan, heat up the oil and honey until they just come to a simmer. Take off heat and add vanilla. 4. Mix the wet ingredients into the dry ingredients and stir to combine. 5. Put on the baking sheet and bake for around 40 minutes or until golden brown, stirring every 10 minutes. This recipe is incredibly versatile. You can add nuts, seeds, dried fruits, cacao nibs… anything your heart fancies. 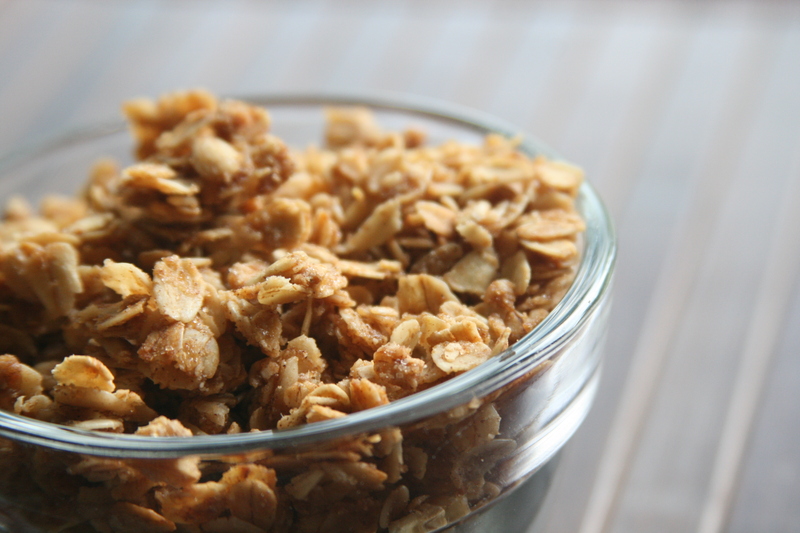 This was always my go-to granola recipe a few years back and I am not quite sure why I ever gave up using it! I always added 1c of sunflower seeds in with the oats and it was awesome. I highly recommend making this and having a bowl full of granola with the milk of your choice. Just doesn’t get much better than that. Want a more natural and gluten-free version? Here’s what changes I will make next time for us! I would consider decreasing the oil a bit as well… but it is just so darn good I don’t think I want to mess with it too much! But I think decreasing the amount of sweetness and using sucanat instead of brown sugar will be the perfect alteration for our taste buds. oh my goodness yum! I haven’t had granola in way too long. I love how it makes my apartment smell! 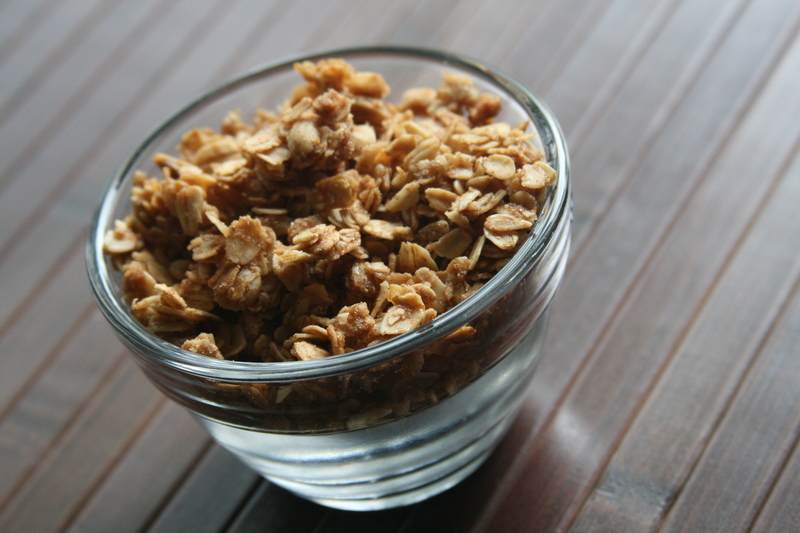 And I’m with you–I could probably rival your oat consumption haha! It really is an awesome smell – I wish it would always smell that good! And I’m not sure if you really could rival my oat consumption… ;).